Rebounding from last week’s loss, the football team left with a 46-28 victory over the Lee Volunteers Fri. The team is now playing for playoff position in the tough 26-6A district. The team started off slow but eventually muscled their way to the win. Isiah Dennis had yet another outstanding performance, showing versatility by rushing for 114 yards while also receiving for 76 yards, both team highs. Quarterback Josh Jung proved to be the backbone of the offense as he completed 60% of his throws for a solid 195 yards and two touchdown passes. Most importantly, he had zero turnovers. With respect to the offense, the defense stole the show with 5 interceptions, one of which was returned for a touchdown by senior safety Nik Tesalona. 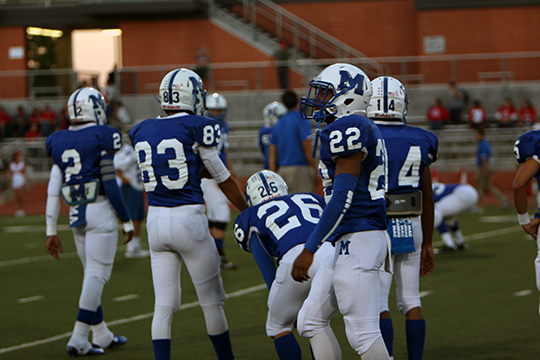 The experienced defensive backs blanketed the Lee receivers all game. The defensive line terrorized Kyle Fuller with every drop back by either sacking him, hitting him, or swatting the ball at the line. The linebackers had their way too, plugging the running lanes all game and holding the Lee running backs to a mere 2 yards per carry. The Rattlers (7-1 W-L) are next on the schedule, but with the “No Fly Zone” defense along with a powerful offense, the team seems to be poised to take on the challenge.